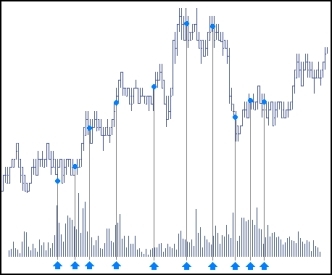 A Volume Sliced order slices a large quantity order into smaller disclosed orders based on trading volume. The resting portion may not be filled before there is enough trading volume to submit the next portion. The Leftover parameter indicates how to handle the resting order when it is time to send the next portion. Options include: Leave, Merge, Market, and Payup. The When parameter defines when the Leftover Action should be performed. The following screen shots illustrate a Volume Sliced order with a goal quantity of 500, a disclosed quantity of 100, a variance percentage of 20, and an interval of 2000. This means that there must be 2000 contracts traded between each disclosed order portion. The Synthetic SE will leave the resting child order in the market when there is the requisite traded volume to submit the next child portion. Child orders will be priced relative to the Ask price minus one tick. The Synthetic SE submits one child order (line 1.1) to the market with a working quantity of 106. The Synthetic SE will leave resting child orders in the market based upon the specified Left over parameter. The parent order (line 1) displays a working quantity of 106 and an undisclosed quantity of 394. Subsequent child orders will be submitted when 2000 contracts have traded . Note: The first child order will not be submitted until the designated interval quantity has traded. Click Advanced Settings drop-down and select Volume Sliced. This is the number of contracts traded between each disclosed order portion. From MD Trader, select the Volume Sliced order configuration. Select the Volume Sliced configuration in the Order Type drop-down list.